Biotinylated Human Mesothelin (296-580), His Tag, Avi Tag (MSN-H82E9) is expressed from human 293 cells (HEK293). It contains AA Glu 296 - Gly 580 (Accession # AAH09272.1). The protein has a calculated MW of 35.9 kDa. The protein migrates as 45-60 kDa under reducing (R) condition (SDS-PAGE) due to glycosylation. Biotinylated Human Mesothelin (296-580), His Tag, Avi Tag on SDS-PAGE under reducing (R) condition. The gel was stained overnight with Coomassie Blue. The purity of the protein is greater than 95%. 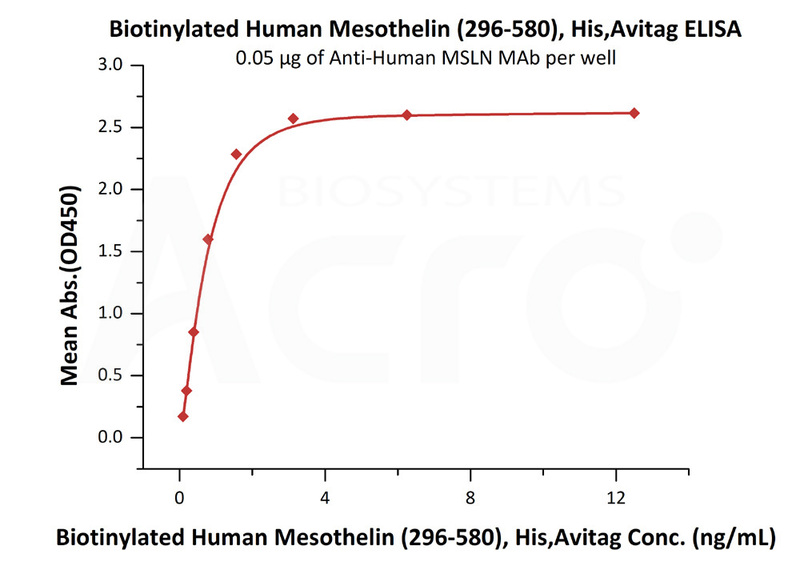 Immobilized Anti-Human MSLN Mab at 0.5 μg/mL (100 μL/well) can bind Biotinylated Human Mesothelin (296-580), His Tag, Avi Tag (Cat. No. MSN-H82E9) with a linear range of 0.1-0.78 ng/mL (QC tested). 293 cells were transfected with Anti-MSLN-scFv and RFP tag. 2e5 of the cells were first stained with B. Biotinylated Human Mesothelin (296-580), His Tag, Avi Tag (Cat. No. 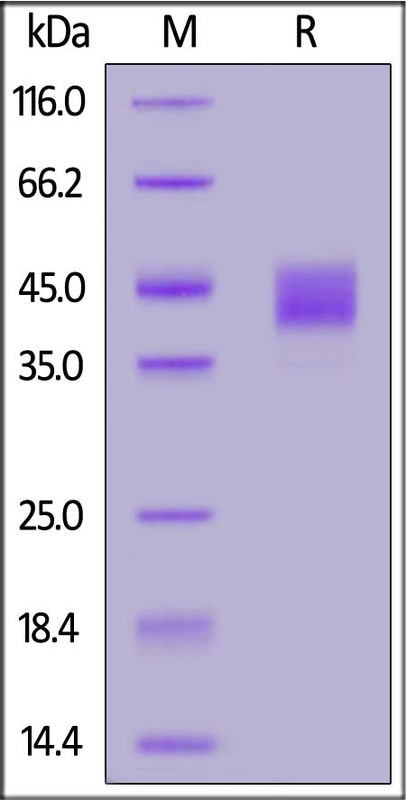 MSN-H82E9, 3 µg/ml) and C. Biotinylated Protein Control, followed by FITC Streptavidin. A. Non-transfected 293 cells and C. Biotinylated Protein Control were used as negative control. RFP was used to evaluate CAR (Anti-MSLN-scFv) expression and FITC was used to evaluate the binding activity of Biotinylated Human Mesothelin (296-580), His Tag, Avi Tag (Cat. No. MSN-H82E9). (1) Chang K., et al., 1996, Proc. Natl. Acad. Sci. U.S.A. 93:136-140. (2) Yamaguchi N., et al., 1994, J. Biol. Chem. 269:805-808. (3) Rump A., et al., 2004, J. Biol. Chem. 279:9190-9198. (4) Ma J., et al., 2012, J. Biol. Chem. 287:33123-33131.